Stretchair, manufactured by Winco Manufacturing, is a bariatric stretcher/chair that is the solution to safer lateral patient transfer, for both caregiver and patient. This highly versatile chair is capable of going from an upright position to infinite recline to lateral transfer, making Stretchair the ideal option for practically any situation. To adjust the chair to and out of any of these positions, simply operate the easy-to-use hand-control pendant. 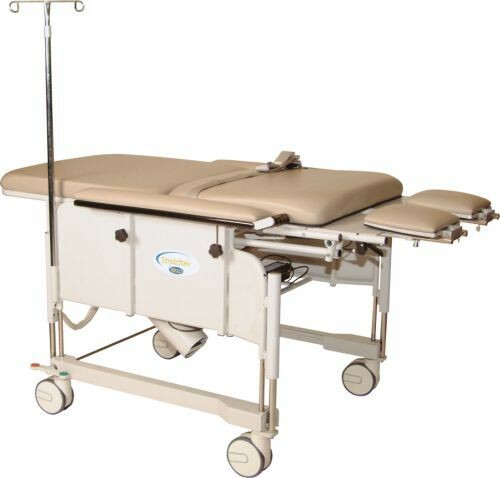 Equally important to position adjustability, this bariatric stretcher features individually adjustable armrests, leg rests, and footrests that will offer greater comfort for each patient. This chair, furthermore, can safely support up to 1,000 lbs. Standard features for this Stretchair include central locking, 6" twin wheel casters, removable HD battery pack, charger, IV pole, oxygen cylinder holder, safety belt, rear storage bin, and upholstered in a multitude of colors to complement your aesthetic flair or decor. If this lateral patient transfer chair does not meet your specific needs, make sure to check out our selection of other bariatric transfer chairs, such as this transport chair or wheelchair for transport, here. Order now and revolutionize patient care in your clinic or home today! 1,000 lb. power recline and transfer weight capacity. 1,000 lb. vertical lift capacity. Central locking 6" twin wheel casters. IV pole with holders on the left and right side. Stand assist grips for easier maneuverability. Upright to infinite recline to lateral transfer position. Maximum Armrest Height: 40 inches. Application: To assist with patient transfer and comfort for bariatric patients.